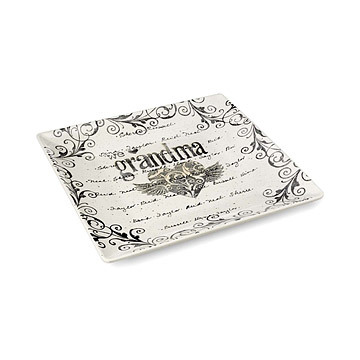 This personalized platter displays the names of up to 20 family members, or any 20 words of your choice. Give the gift of family and friends with this touching personalized platter that displays up to 20 family member or friends' names (or any 20 words of your choice). Choose any first name for the center (Nana, Mom, Carol) up to 10 characters (including spaces). Some text will be obscured by design. Lower case only. Hand-stamped and painted by Sheree Burlington in New Hampshire. Sheree Burlington's pottery is playful, with a modern vintage look that's all her own. Inspired by mixed media collage, her pieces range from witty to inspirational. Sheree began her career designing interiors and kitchens. A visit to a local paint-your-own pottery studio inspired her to open a trio of her own. Customers were so enthused about her creations that she decided to establish a full-fledged pottery design studio in Pembroke, New Hampshire. Included: Name, word or phrase (maximum 10 characters, including spaces) and up to 20 names, words or alternate text (written in order, repeated, and hyphenated as space allows.) Some text will be obscured by design. Due to the custom-made nature of this item, it cannot be returned. Crooked letters, slight differences in size, paint color, image placement and composition are common characteristics of a hand made product. Wonderful gift. Quick shipment. Plan to order again! Love this so much. Would like to be able to order a smaller size for less momentous occasions. I have given this plate as a gift three times and have been very happy. Each recipient has loved it. It's a wonderful gift to commemorate special times shared with friends. Handpainted pottery that is even more beautiful than the photograph would lead you to believe. It arrived earlier than expected and was packaged very well. This personalized plate is spectacular. This product is spectacular. I cannot wait to see my MIL and FIL's eyes when they open it. Beautiful platter made for our parents 50th Anniversary. Will be displayed in a cabinet and used on special occasions. Practical and unique. LOVED IT! This personalized dish was more beautiful than expected. It was shipped with care, well packaged. Looking forward to giving it to my parents on Christmas. Thank you. Perfect wedding gift from a group of sailing friends - I was able to get everyone's name on the platter including bride & groom and best of all - it arrived well in advance of expectation. Definitely an Uncommon Good! Extremely well-packaged; item was fragile and arrived in perfect condition. The quality of this platter was superb, and the idea behind it brilliant. Well-executed with flair and precision. I gave it as a thank-you gift to the friend who hosted my daughter's baby shower, and listed all the guests' names. It was just right: a true surprise, delight, and remembrance of a wonderful time, while acknowledging my wonderful friend. Perfect!